Hey all!!! I have a lefty 1981 4003 in Burgundyglo, that I bought in pretty rough shape, I am thinking about sanding it down to the bare wood (ala McCartney). My question is, will sanding it down hurt the resale value? I am kicking around the idea of selling it..... Any thoughts? In a word, yes. Now, depending on just how badly worn it is, a proper refin won't hurt it, and might help it. Jingle-Jangle can give you better advice on this. Until then, the conventional wisdom is to put a little bit of finish patch (usually clear) on the areas that are susceptible to perspiration and further wear, and just play it. is there a way to post pictures of it on this site, so I can accentuate what I'm talking about? Even a well worn original finish is much better than a sanded-down-by-yourselv-one in case of trade... You won't get more than half the price (If you are lucky) - and it's much more difficult to sell because most people don't want guitars that has lost their original shapes - which they almost always do during the sading proces (even McCartneys did...). Would you buy such a guitar yourself? That said - is there something nicer than a good old worn finish? Low-res images can be uploaded via the "upload attachment" option when using the full "post reply". You can also link to an image that is already on the web (e.g. on a pic-hosting site) using the "Img" button on the full "post reply" screen. These functions are reasonably easy to use. Either I'm completely retarted or computer illiterate or a little of both, but I've tried several different ways to upload these pictures, if I were to send them to someone, could they post tem? I would appriciate the help, thanks in advance. 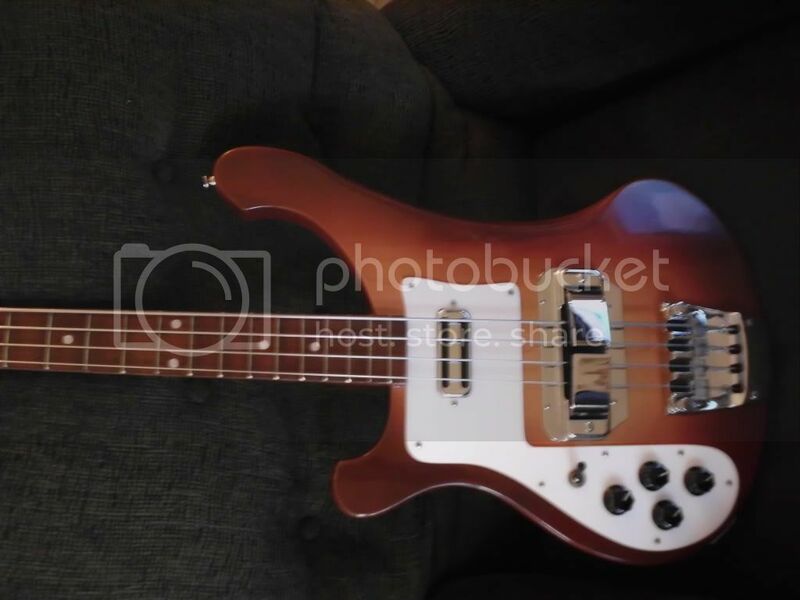 I have a right-handed Burgundy-glo 4003 that was made in 1980, and looks like a mirror image of your bass, even down to the two-piece pickguard. Nice bass! From the picture it looks like most of the chipping is on the edges of the headstock. I would either leave it alone, or maybe use gloss model paints to touch up the chipped areas. I've done this in the past with a Burgundy-glo 4001, and it turned out well. I know that Tamiya (manufacturers of plastic models and model paints) markets a clear red gloss paint--in other words, red but you can see the grain of the wood through the paint--along with a clear blue. Seems like you could mix the two until you get a match in the shade, then touch up the chips. I would agree with the other folks who suggest not to sand the finish, especially since Burgundy-glo is such a cool and desirable Rick color. My bass has a quarter-sized chunk out of the finish in the back, where some goober who owned it before me must have worn a big ol' belt buckle, but I elected not to try and touch up that area, since it's not visible from the front of the instrument. Just looked up the Tamiya paint on the web. It looks much more red (and less pink) in the bottle. You could probably find it in most hobby stores. Check out MY Ric restoration. My Ric usded to be a lefty Tuxedo all white bass. for the stripping, sanding, refin etc) It took about a month to cure the clear coats (about 8). I was going to do the physcadelic Magical Mystery Tour paint job, but since the aged FG came out so well, I thought I'd "let it be" for now.